Zipfizz is a great tasting, HEALTHY energy/sport drink-mix that delivers a powerful charge of micronutrients to the body's fuel system. This Ultimate Variety Pack consists of one tube each of the 10 great flavors: Berry, Blueberry Raspberry, Citrus, Grape, Orange Soda, Pink Grapefruit, Pink Lemonade, Fruit Punch, Orange Cream, Black Cherry. 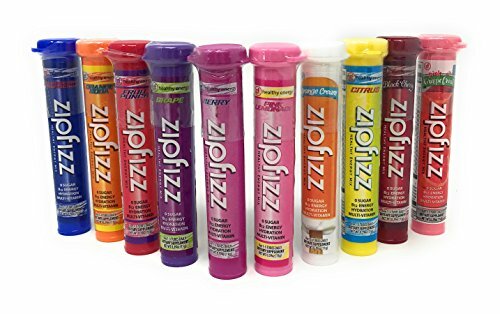 Zipfizz supplies a convenient rush of vitamins, minerals, electrolytes, and key amino acids that help provide rapid hydration. Perfect for athletes, busy families, students, executives, and people on the go. Zipfizz's advanced formula delivers a revitalizing burst of energy and focus. 1 Tube Each of 10 Great Flavors. Find Your Favorite!